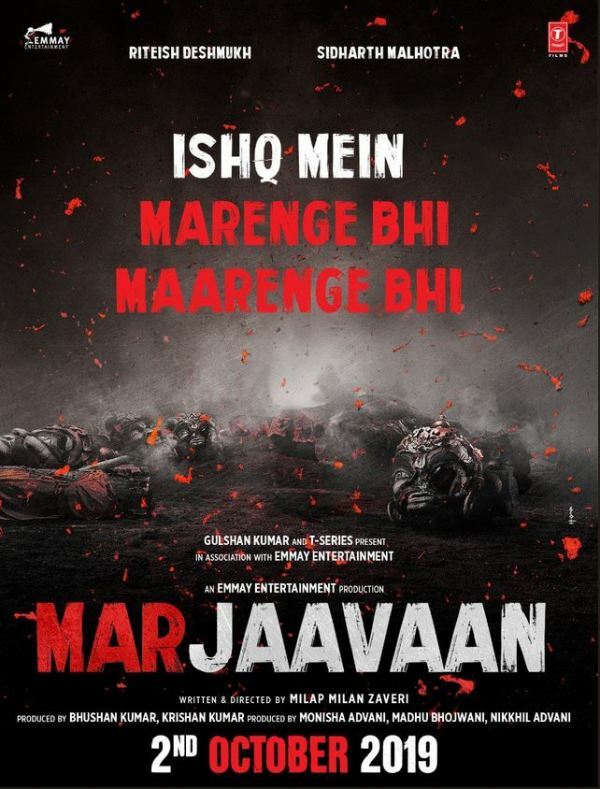 Satyameva Jayate film makers Bhushan Kumar, Nikkhil Advani and Milap Milan Zaveri join hands once again and announced the next film titled Marjaavan. The film Stars Riteish Deshmukh, Sidharth Malhotra, Tara Sutaria in a pivotal roles. After Student of the Year 2 film, Tara Sutaria bags one more film Marjaavaan opposite Siddharth Malhotra. Interestingly, Ek Villain Actor Riteish and Sid are back one more time in a Thriller film. Sidharth Malhotra revealed the Poster and wrote, “A Love Worth dying for, A thrilling game of love and death with riteish again” Earlier Sidharth Malhotra and Riteish Deshmukh worked together in Ek Villain and the film have been the big Hit. Now, they are back one more time and we are sure that fans of them would be excited to see them on big screen. Ek Villain was written by Milap Zaveri and now he is the director for Marjaavan film. It looks director Milap Zaveri is now focusing on film direction apart from Writing Films. Also, They have earlier directed romantic films Jaane Kahan Se Aayi Hai, Mastizaade, Satyameva Jayate. Zaveri’s John Abraham Starrer Satyameva Jayate have been the Big Hit and now he is back on working for the Same Thrilling Genre for his film Marjaavan. The film is to be directed by Milap Milan Zaveri and the Shooting of the film Starts in December 2018. Marjaavan film scheduled to release on 2nd October 2019.